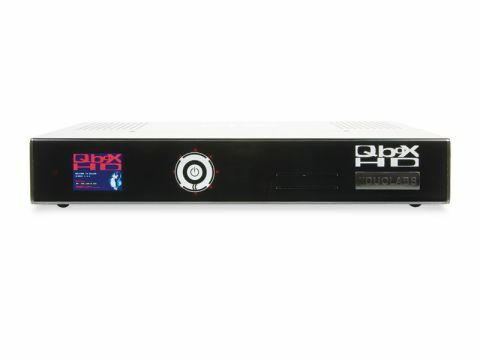 The Dreambox has sired a whole industry – the manufacture of enthusiast-grade set-top boxes powered by the Linux operating system. All of these receivers tend to be highly customisable, and there are plenty of firmwares to choose from. One of the most popular is Enigma (now in its 'Mark 2' guise). Indeed, Enigma II is the firmware supplied as standard on the Qbox HD, a sophisticated hi-def receiver from a new player in the Linux set-top box game. Duolabs, based in Italy, also sells a standard-def Qbox (the 'Qbox One'). Oddly, this more affordable unit can accommodate an internal hard drive for PVR use. The Qbox HD tested here can't – but can record to an external drive. Aesthetically, the Qbox HD is quite unlike any receiver we've seen before. A series of red LEDs recessed into the base of the unit pulse on or off , making for quite a light show. Then there's the iPod-influenced 'SenseWheel', a touch-sensitive front-panel navigation device that does take some getting used to (luckily, it can be customised). In contrast, the remote is something of a plain Jane. Its crowning glory, though, has to be the crystal-clear 2.5in colour LCD screen that sits to the left of the SenseWheel. This provides, among other things, menu-related information, scan progress, start-up screens and a clock. Beware, the displayed text can be tiny. On the right side of the front panel are two card slots (some firmwares will emulate CAMs) and a CI slot that has been clumsily blanked off with a plastic bung – remove this to fit the CAM of your choice. In connectivity terms, there's a lot going on – certainly on the rear panel (the front, sadly, lacks even a USB socket). The Qbox makes provision for up to three tuners. DVB-C (cable, though not suitable for UK use), DVB-S/S2 (satellite) and DVB-T (terrestrial) varieties are available, and can be mixed and matched. As with some other Linux receivers, the tuners plug into proprietary slots mounted on the receiver's main circuit board – an easy enough job. Our review sample was supplied with DVB-T and Sharp-made DVB-S/S2 tuners (both of which are equipped with loopthrough outputs). A decent complement of video outputs are offered. In addition to RGB/composite Scart and composite phono are component and HDMI (up to 1080i). A second VCR Scart is also available. Three USB ports (one reserved for a memory device containing the firmware) and an external SATA connector ready the Qbox for multimedia playback and PVR use – Ethernet opens up various possibilities including upgrades, streaming and remote control (not all of which are currently supported). Up to three antennas can be installed if you want to add Wi-Fi. Finally, we have analogue phono and AC3-ready optical digital audio outputs (decoded audio or AC3 bit streams can also be carried via HDMI) and an RS232 port for legacy upgrade purposes. A series of step-by-step wizards will painlessly guide you through the process of installing the receiver. They cover language, TV system, time zone, initial dish/DiSEqC configuration and searching for channels – all parameters that can be modified later on via the setup menus, of which there are many. Among the main menu's nine choices is 'setup', which itself boasts no fewer than 10 options. Unless you're happy with what the wizard came up with, the first port of call (after aligning your dish using the Satfinder, perhaps) should be the 'service searching' item. Select a satellite and transponder and you're treated to large bar graphs for signal-to-noise ratio, automatic gain control level and bit error rate. There's no audio bleeper but the feature can nevertheless be useful for basic alignment of a fixed dish, as well as periodic signal checks. The 'service searching' menu's 'tuner configuration' option lists the available tuners (up to three). It's then a matter of selecting the one of interest. If you have a terrestrial tuner fitted you can select the local transmitter. For satellite (DVB-S/S2) tuners, the options are naturally different; you can select the type of dish setup in use – single (fixed dish), simple tone burst switching (two-port), DiSEqC (four-port) and motorised (USALS/ DiSEqC 1.2 – with dish movement options). The parameters beneath then change, depending on the mode selected, but in all cases you can select a 'target' satellite. A choice of two tuner configuration modes – simple and advanced – is offered. The advanced one gives you more control over various aspects. What's annoying is that if you've only specified a single-satellite configuration (i.e. no DiSEqC) the machine goes through each of the other satellites in its database and asks whether you want to delete it or not. Searches can be manual or automatic. You can specify which tuner is given scanning priority and whether any existing channel lists should be erased beforehand. Automatic scans won't discriminate, finding all TV and radio channels whether hi-def or standard-def, encrypted or free to air. In this mode multiple-satellite searches can be carried out, the dish moving automatically where necessary. It's a pity that manual searches don't permit PID entry; you can, however, tell the receiver you only want free channels. Blind search is also missing. We hope such a feature will be added via the Enigma plug-in architecture. Unless you want to waste time searching your section of the Clarke Belt you're advised to use the manual 'single satellite' mode to search each one of interest individually. Other setup menus look after the CI slots, network configuration, languages, the appearance and complexity of the 'skinnable' user-interface, customisation tweaks and AV matters. Other handy features are a test-pattern generator for adjusting your TV's contrast and brightness control and 'red star' button on the handset acting as a shortcut to one of nine functions. Unfortunately, the supplied manual had not been changed to reflect the fact that the Qbox HD comes with a different handset, although the onboard 'help' system makes reference to it using the latest firmwares. If you've used Enigma-based receivers in the past you'll soon get used to the receiver. If you're not, then expect a bit of a learning curve. Although 'channel stepping' is permissible, the main channel-selection menu is more flexible. It presents you with a series of basic choices that are selected with the handset's coloured keys. 'All' displays a 'master list' of all available channels, while 'satellites' allows you to home in on a specific bird. The remaining two are 'provider' and favourites. As with other Enigma-based firmwares, channels are organised into lists known as bouquets. It's easy to add and remove bouquets, courtesy of the favourites lists – into these can be placed individual channels or provider-specific groups of channels. It therefore follows that you can have as many favourites lists as you like, subject to available memory capacity. You can only add and remove channels from these bouquets – the master list cannot be changed. Satellites can be deleted. If the relevant EPG data is in the machine the name of the programme currently being broadcast by the channel is shown in the channel list. The EPG, which supports both now-and-next and seven-day schedules, is accessed by pressing the handset's 'info' button. It's a bland text list and not the 'magazine' format of traditional receivers. One EPG mode focuses on one channel's schedule; another ('multi') allows you to see what your bouquets are offering in the current or a future timeslot, complete with progress bars. A 'zap' button jumps to the highlighted channel; the timer can also be programmed from the EPG and there's a manual timer too. Up to four standard-def (or two HD) recordings can be made simultaneously. When a recording is in progress you can view either this or an existing one. Timeshifting is also possible. We used an external SATA drive for PVR use – despite assertions to the contrary in the manual, our USB ones wouldn't do (but they were recognised by the onboard media player). Storage is Linux formatted, which would make it difficult to directly transfer recordings to a Windows PC. Our advice is to transfer recordings across the network instead using the FTP client. One of Enigma's advantages is its 'plug-in' architecture, which allows new features to be added. To this end a plug-ins browser/manager is one of the Qbox's main menu options. At the time of writing no plug-ins beyond the pre-installed ones were available. The latter include VLC's Video Player, a web interface and a picture player. The onboard media player wouldn't list MP3 files stored on a USB device, let alone play them, but MP3 audio was recognised in the DivX HD player (though the receiver won't play HD file formats). Typing the receiver's address into the browser presents you with the Qbox web interface. Channels can be remotely selected from here; you can also invoke recording, access EPG info and set timer events. This proved to be somewhat erratic, with pages not being displayed. A WebTV function, presumably for streaming live TV from the box over a network, didn't work either. After problems with an initial sample we tested the Qbox using the latest firmware (and bootloader) that proved stable and worked with the supplied handset. Like many Enigma-based receivers, the Qbox can take a long time to start up from cold; waking up from standby is much faster. Searching speeds can be slow. Although a full search of the Astra 1x cluster was completed in just over five minutes, a Hot Bird scan took over 11 minutes. The user interface and menu system were responsive, channel changing taking about a second. Sound quality and picture quality are both excellent, especially if HDMI is employed. Sensitivity is fair – the Sharp DVB-S/S2 tuner seems to doing a good job.